Observations with ESO's Very Large Telescope (VLT) in Chile and the Italian Telescopio Nazionale Galileo (TNG) on the Canary Islands during the past two years have enabled an international group of astronomers  to unravel the true nature of an exceptional binary stellar system. This system, designated RX J0806.3+1527 , was first discovered as an X-ray source of variable brightness - once every five minutes, it "switches off" for a short moment. The new observations have shown beyond doubt that this period reflects the orbital motion of two "white dwarf" stars that revolve around each other at a distance of only 80,000 km . Each of the stars is about as large as the Earth and this is the shortest orbital period known for any binary stellar system. The VLT spectrum displays lines of ionized helium, indicating that the presence of an exceedingly hot area on one of the stars - a "hot spot" with a temperature of approx. 250,000 degrees. The system is currently in a rarely seen, transitory evolutionary state. One year is the time it takes the Earth to move once around the Sun, our central star. This may seem quite fast when measured on the scale of the Universe, but this is a snail's motion compared to the the speed of two recently discovered stars. They revolve around each other 100,000 times faster; one full revolution takes only 321 seconds, or a little more than 5 minutes! It is the shortest period ever observed in a binary stellar system . This is the surprising conclusion reached by an international team of astronomers led by GianLuca Israel of the Astronomical Observatory of Rome , and based on detailed observations of the faint light from these two stars with some of the world's most advanced telescopes. The record-holding binary stellar system bears the prosaic name RX J0806.3+1527 and it is located north of the celestial equator in the constellation Cancer (The Crab). The scientists also find that the two partners in this hectic dance are most likely a dying white dwarf star, trapped in the strong gravitational grip of another, somewhat heavier star of the same exotic type. The two Earth-size stars are separated by only 80,000 kilometers, a little more than twice the altitude of the TV-broadcasting satellites in orbit around the Earth, or just one fifth of the distance to the Moon. The orbital motion is very fast indeed - over 1,000 km/sec, and the lighter star apparently always turns the same hemisphere towards its companion, just as the Moon in its orbit around Earth. Thus, that star also makes one full turn around its axis in only 5 minutes, i.e. its "day" is exactly as long as its "year". The visible light emitted by this unusual system is very faint, but it radiates comparatively strong X-rays. It was due to this emission that it was first detected as a celestial X-ray source of unknown origin by the German ROSAT space observatory in 1994. Later it was found to be a periodically variable source . Once every 5 minutes, the X-ray radiation disappears for a couple of minutes. It was recently studied in greater detail by the NASA Chandra observatory. The position of the X-ray source in the sky was localised with sufficient accuracy to reveal a very faint visible-light emitting object in the same direction, over one million times weaker than the faintest star that can be seen by unaided eye (V-magnitude 21.1). Follow-up observations were carried out with several world class telescopes, including the ESO Very Large Telescope (VLT) at the Paranal Observatory in Chile, and also the Telescopio Nazionale Galileo (TNG) , the Italian 4-m class observatory at the Roche de Muchachos Observatory on La Palma in the Canary Islands. The observations in visible light also showed the same effect: RX J0806.3+1527 was getting dimmer once every 5 minutes, while no other periodic modulation was seen. 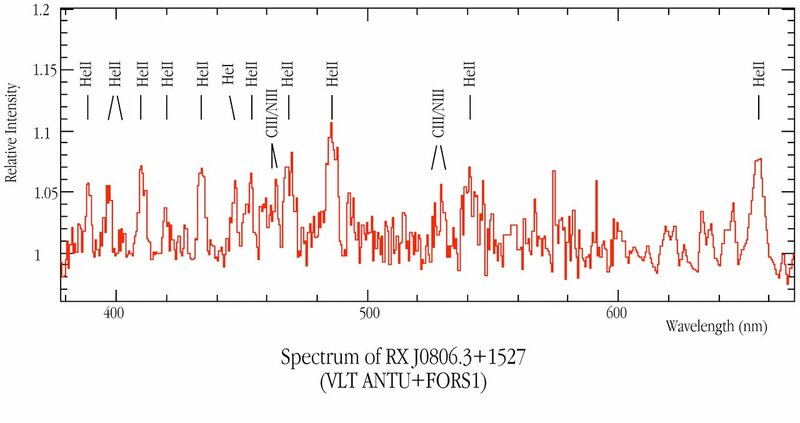 By observing the spectrum of this faint object with the FORS1 multi-mode instrument on the 8.2-m VLT ANTU telescope, the astronomers were able to determine the composition of RX J0806.3+1527 . It was found to contain large amounts of helium ; this is unlike most other stars, which are mainly made up of hydrogen. "At the outset, we thought that this was just another of the usual binary systems that emit X-rays", says Gianluca Israel . "None of us could imagine the real nature of this object. We finally solved the puzzle by eliminating all other possibilities one by one, while we kept collecting more data. As the famous detective said: when you have eliminated the impossible, whatever remains, however improbable, must be the truth!". Current theory predicts that the two stars, which are bound together by gravity in this tight system, produce X rays when one of them acts as a giant "vacuum cleaner", drawing gas off its companion. That star has already lost a significant fraction of its mass during this process. The incoming matter impacts at high speed on the surface of the other star and the corresponding area - a "hot spot" - is heated to some 250,000 °C, whereby X rays are emitted. This radiation disappears for a short time during each orbital revolution when this area is on the far side of the accreting star, as seen from the Earth. Our Sun is a normal star of comparatively low mass and it will eventually develop into a white dwarf star. Contrary to the violent demise of heavier stars in a glorious supernova explosion, this is a comparatively "quiet" process during which the star slowly cools while losing energy. It shrinks until it finally becomes as small as the Earth. The Sun is a single star. However when a solar-like star is a member of a binary system, the evolution of its component stars is more complicated. During an initial phase, one star continues to move along an orbit that is actually inside the outer, very tenuous atmospheric layers of its companion. Then the system rids itself of this matter and develops into a binary system with two orbiting white dwarf stars, like RX J0806.3+1527 . Systems in which the orbital period is very short (less than 1 hour) are referred to as AM Canis Venaticorum (AM CVn) systems, after first known binary star of this rare class. It is likely that such systems, after having reached a minimum orbital period of a few minutes, then begin to evolve towards longer orbital periods. This indicates that RX J0806.3+1527 is now at the very beginning of the "AM CVn phase". With its extremely short orbital period, RX J0806.3+1527 is also a prime candidate for the detection of the elusive gravitational waves, predicted by Einstein's General Theory of Relativity. They have never been measured directly, but their existence has been revealed indirectly in binary neutron star systems. A planned gravitational wave space experiment, the European Space Agency's Laser Interferometer Space Antenna (LISA) that will be launched in about 10 years' time, will be sufficiently sensitive to be able to reveal this radiation from RX J0806.3+1527 with a high degree of confidence. Such an observational feat would open an entirely new window on the universe. : The team consists of GianLuca Israel and Luigi Stella at the Astronomical Observatory of Rome (Italy), Stefano Covino and Sergio Campana at the Astronomical Observatory of Brera (Milan, Italy), Wolfgang Hummel, Gianni Marconi and Gero Rupprecht at the European Southern Observatory, Immo Appenzeller and Otmar Stahl at the University of Heidelberg (Germany), Wolfgang Gassler and Karl-Heinz Mantel at the University of Munich (Germany), Christopher Mauche at the Lawrence Livermore National Laboratory (USA), Ulisse Munari at the Astronomical Observatory of Padua (Italy), Ignacio Negueruela at the Astronomical Observatory of Strasbourg (France), Harald Nicklas at the University of Göttingen (Germany), and Richard Smart at the Astronomical Observatory of Turin (Italy). : See the research article by Israel et al. (1999, Astronomy &A, Vol. 349, p. L1). The results described in this Press Release were announced in IAU Circular 7835 and will shortly appear in print in the European research journal Astronomy & Astrophysics Letters ("RX J0806.3+1527: a double degenerate binary with the shortest known orbital period (321 s)" by G.L. Israel and co-authors), cf. astro-ph/0203043. The 5-min optical modulation was detected independently by another group led by G. Ramsay, cf. astro-ph/0203053.